On the third day, they came for my flesh; having let it boil for three days. Though dead, and thus understandably presumably well on my way; I had by some stroke of luck found myself trapped in my body, despite having been thoroughly boiled. Surprisingly, being eaten, after all that, is a strangely painless process; and once spread into the flesh of the tribe, I found myself a creature of greater scope: I could see where those only saw darkness. I stretched my new body. It took three thousand years to scratch an itch; but that just made all the sweeter when the body finally rippled into action. Users who like do you like see-food??? Users who reposted do you like see-food??? Playlists containing do you like see-food??? 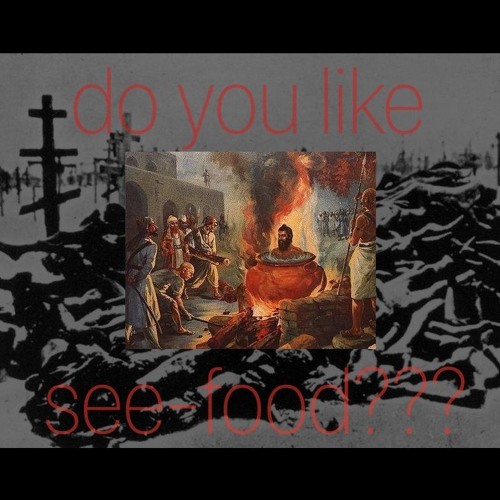 More tracks like do you like see-food?? ?